25/9/12 - Restoration - Albi, Musée Toulouse-Lautrec - When the Musée Toulouse-Lautrec reopened we had pointed out (see the article in French) that, among the discoveries made during the extensive restoration work on the premises, a gallery (known as the Galerie d’Amboise) was being restored, occupied by scaffoldings. 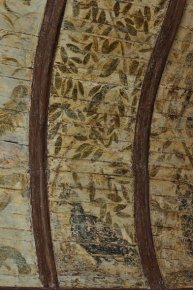 These had been left in place because the restorers suspected that the uniform grey color of the ceiling in the shape of an inverted hull concealed an artistic treasure. Indeed, in April 2012, after just two panels had been cleaned, a rich iconographic program was revealed below the céruse repainting. 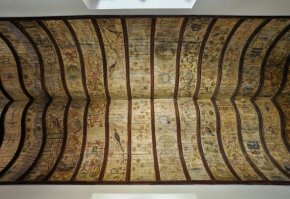 The ensemble has now been unveiled and visitors can admire the entire length of this splendid ceiling with its ogée shaped sections (ill. 1 to 3). 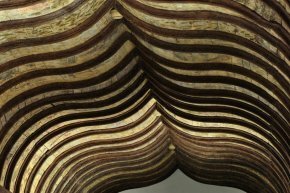 Dendrochronological studies of the roof frame have established a production date going back to the very late 15th century. Anne-Marie Sire, Inspector General for Historical Monuments, points out that at the time, galleries were a fashionable room to have in châteaux or city residences, mentioning the "Galerie des Cerfs" in Gaillon, another one in Blois, others at Chantilly, the Palais de Nancy, the abbey in Saint-Germain-des-Près, etc. and of course the "Galerie d’Ulysse" which François I built at Fontainebleau in 1528, 150 m. long. The first iconographic programs were inspired by hunting traditions (thus the many "Galeries des Cerfs" or "Deer Galleries") then turned to the illustrations of late courtly love works such as Poliphilo’s Strife of Love in a Dream by Francesco Colonna (published in 1499) and Petrarch’s Triumphs (which appeared in 1471). "In the gallery at the Palais de la Berbie, the paintings are organized from one bay to the next in a very similar construction : starting out from an animal figure presented at the base (heron, swan, squirrel...) scrolls of ornamental foliage rise, filled with angels and birds (owls, great spotted woodpeckers...) showing cartellini bearing inscriptions which are now illegible. Small rectangular paintings appear here and there illustrating landscapes and gardens. In the center of the gallery, there is a mitre which seems to allude to the patron who commissioned the work, the bishop of Albi", explains Anne-Marie Sire. "A veritable ornamental greenhouse" inspired, in its iconography "by the details painted by the monks who copied the illuminated manuscripts in the Middle Ages". This is indeed a valuable discovery for the new Palais de la Berbe which presents many additional treasures. However, why in heavens was this gallery not left intact of any modern intrusions by installing, along the wall on the garden side, explanatory texts which could (and should) have been at the entrance to this marvelous gallery.